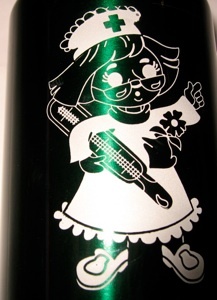 Something different and fun - Engraved water bottles! We have a number of red, blue, green and silver water bottles that can be engraved with any of our thousands of designs and a name. 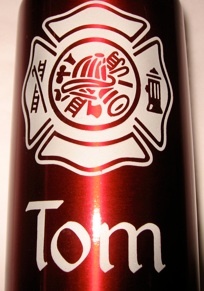 Engravable Fireman Water bottle $19.95 engraved with 6 letter name and the nurse. 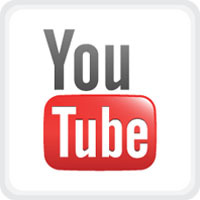 Additional engraving is $1 per letter. Engravable Nurse Water bottle $19.95 engraved with 6 letter name and the nurse design. Additional engraving is $1 per letter. 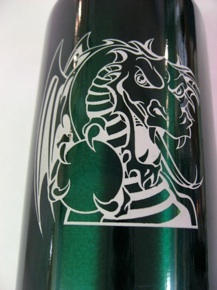 Engravable Dragon Water bottle $19.95 engraved with 6 letter name and the Dragon design. Additional engraving is $1 per letter. 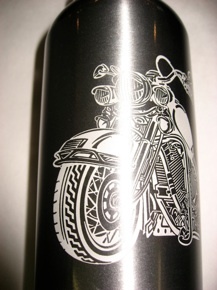 Engravable Motorcycle Water bottle $19.95 engraved with 6 letter name and the Motorcycle design. Additional engraving is $1 per letter. 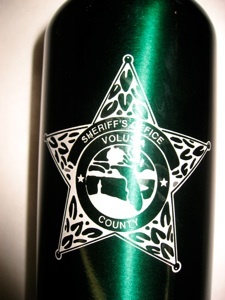 Engravable Volusia County Sheriff Water bottle $19.95 engraved with 6 letter name and the Volusia County Sheriff design. Additional engraving is $1 per letter. Engravable High Heel Water bottle $19.95 engraved with 6 letter name and the High Heels design. Additional engraving is $1 per letter.